Since I have returned from my travels abroad I have been on an absolutely crazy schedule; even more than usual for this time of year. We have had family and friends visiting from out-of-town, blogging commitments, and the mad rush of trying to get all the details done for Christmas. 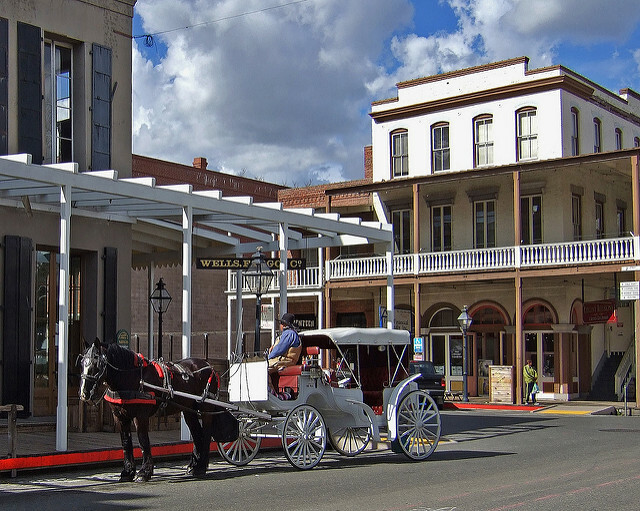 As our friends who were visiting have an interest in history (and sadly don’t drink much wine), we thought we would take them to see Old Town Sacramento. It is cute, charming, and a fun little place to go for lunch or dinner while immersing yourself in the feeling of the Old West. It was a beautiful, bright day filled with sunshine so it seemed a good opportunity to get out and explore. As we are always looking for opportunities to blog, we wanted a new restaurant about which we could talk. We looked on Yelp, but it seemed unhelpful for the area. We ended up wandering through the town, slowly looking at all the posted menus to find a place that sounded good. 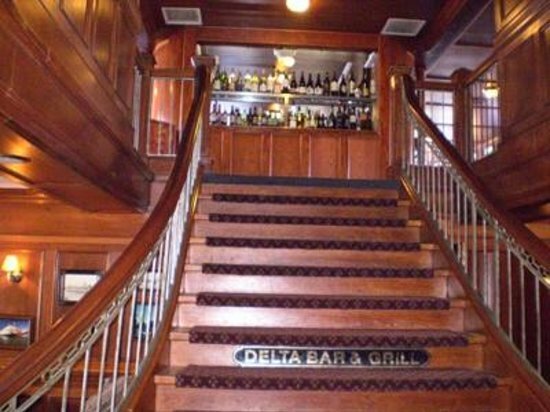 Finally, our friend suggested The Delta King as we passed. 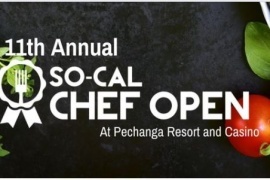 The Brit and I didn’t think they had an open restaurant; it was a hotel and dinner theater place right? Well, it looked as though we were wrong. 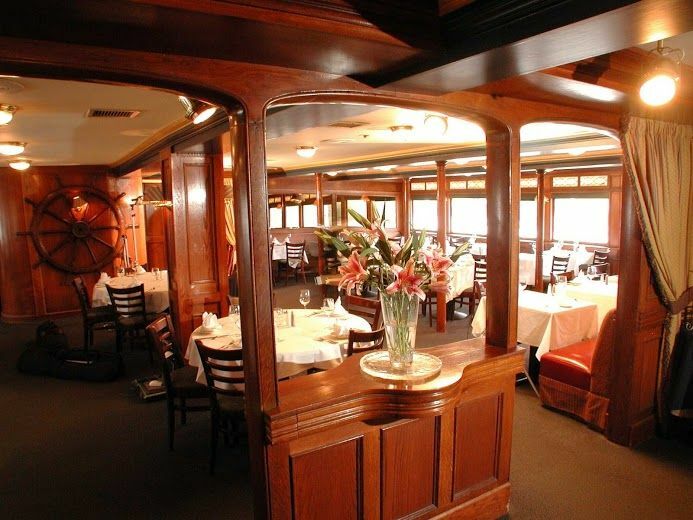 We climbed aboard after studying their menu and deciding it was exactly what we wanted. 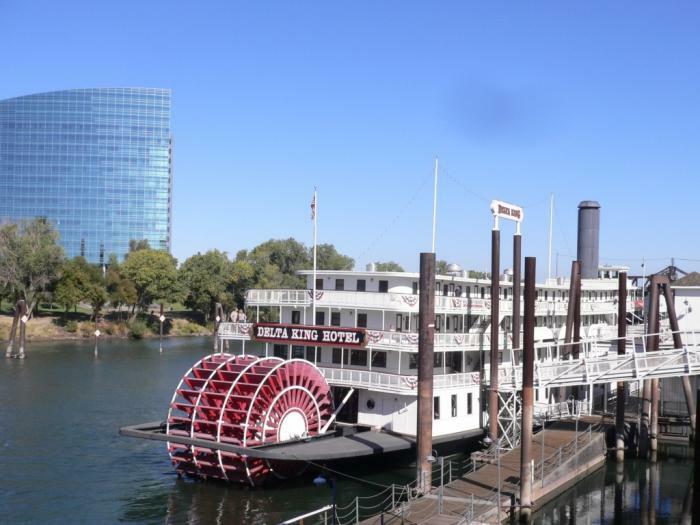 The Delta King is an old-fashioned riverboat built in 1927. 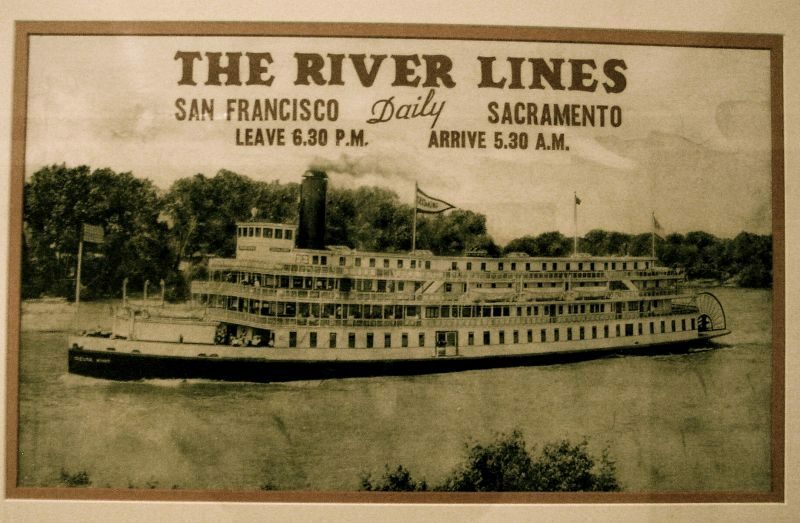 It used to be a floating casino and jazz club/speakeasy; carrying people down the Sacramento river to San Francisco. It was purchased in 1984 by a family of siblings who found it in a derelict state and who have restored it to its former glory. It’s distinctive red paddle gives the boat a bit of extra sparkle and reminds me of the jazz that used to play on board. In 1927, staterooms were a mere $3.50, but you could bring your own blanket and sleep on deck for just $1.00! What a bargain! It is now a working hotel with forty-four staterooms, two theaters, two restaurants, and a wine school. How the heck did we miss this last thing? I tried to look on their website for more information about the wine school, but didn’t see anything other than it mentioned. I will have to find out more details on that. As we entered the boat, I noticed all the gleaming wood and lovely finishes. We were greeted by a host and sat close to the window so we could enjoy the beautiful view of the river. I have to say I was a little chagrined and amazed that we had never been there. We had talked many times with friends about going to the dinner theater, but never had we considered eating there. We had been missing out! The restaurant was lovely and the service was great. My lunch started out with a cup of their split pea and ham soup. I have to be honest, it was absolutely delicious. 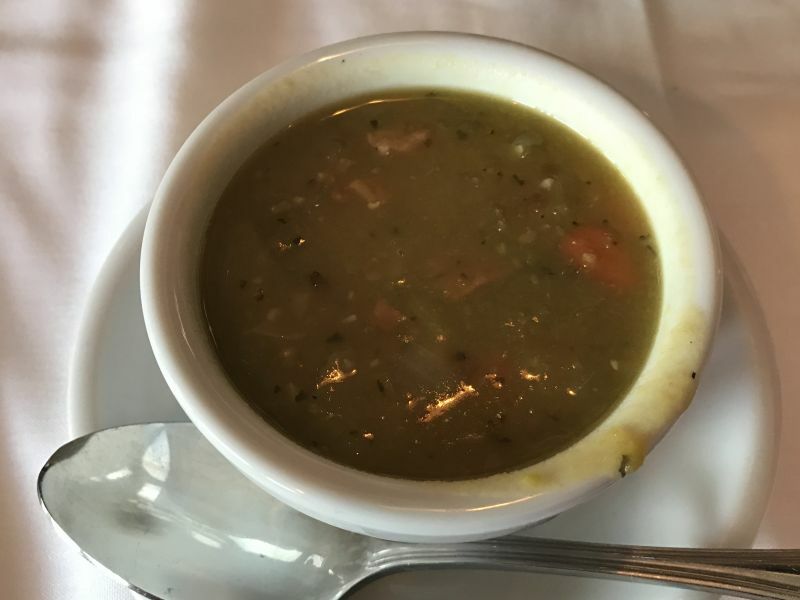 Huge chunks of smoked ham in a perfect flavorful split pea soup; a real winner. I passed my cup around to my friends and they were in agreement and a little envious of my choice. The Brit comments: I started with a glass of Old Vine Zinfandel from Fiddletown Cellars, a vineyard in the Sierra Foothills. There was a deep, rich nose that was matched for intensity by a great jammy mouth. Once again, I was reminded that we need to do a tour of wineries in this region. 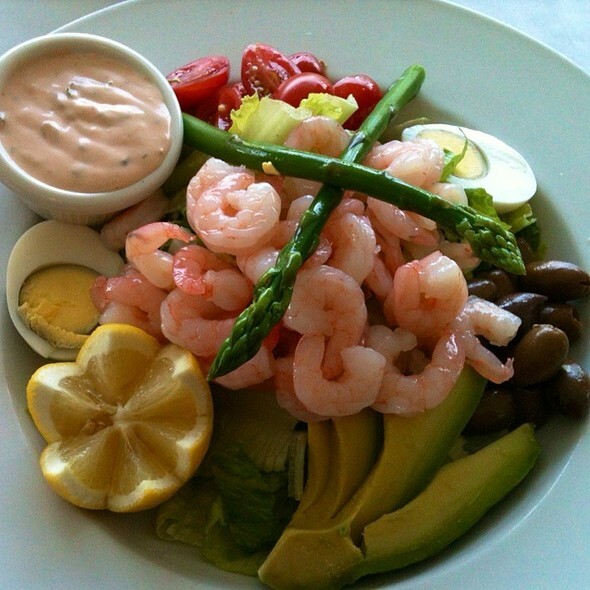 Our friends ordered plates to share: Fish and chips plus a shrimp Louie salad. Both of them looked so good as they were served. All of the components were fresh and well executed. We all loved that the fries/chips were thick cut and cooked perfectly: crispy on the outside, fluffy and creamy on the inside. A huge thumbs up. 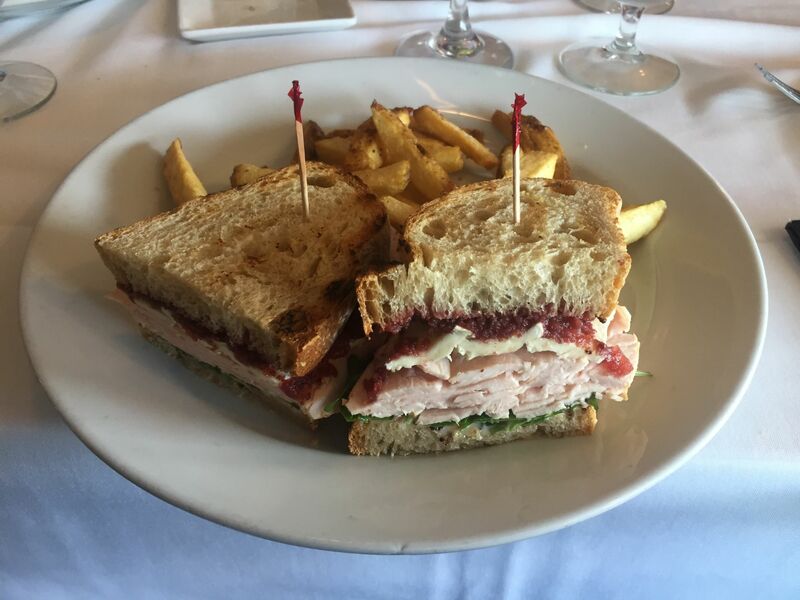 The Brit ordered the apple-wood smoked turkey sandwich with cranberry sauce and fries. He absolutely loved his dish and appreciative sounds could be heard from all over the restaurant from him. The Brit comments: The meat was sliced thick with a subtle smoke. The arugula leaf was fresh and crisp. The sourdough bread was lightly toasted. The fries were perfectly salted. 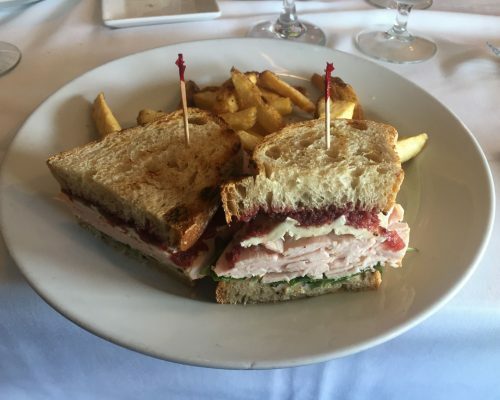 Whilst, a turkey sandwich may not sound like a tricky dish; I was impressed that all the individual components and the balance between them was spot on. 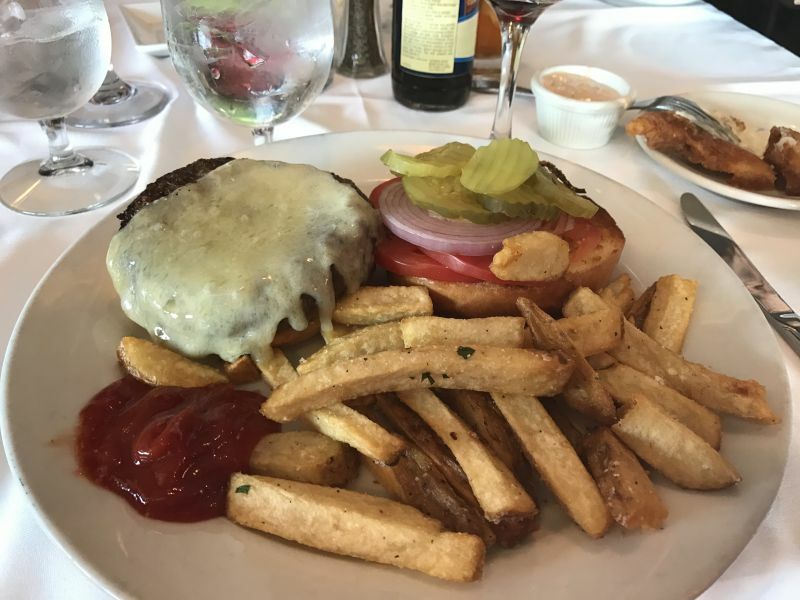 I ordered the Kobe burger, medium rare ,with fries. (Yes, I know it was very unhealthy of me.) I also was boring and ordered a glass of Meiomi Pinot Noir to drink with it as I was over-tired I couldn’t even think. The light cherry fruit flavors are so easy to drink and goes with just about anything you want to throw at it. 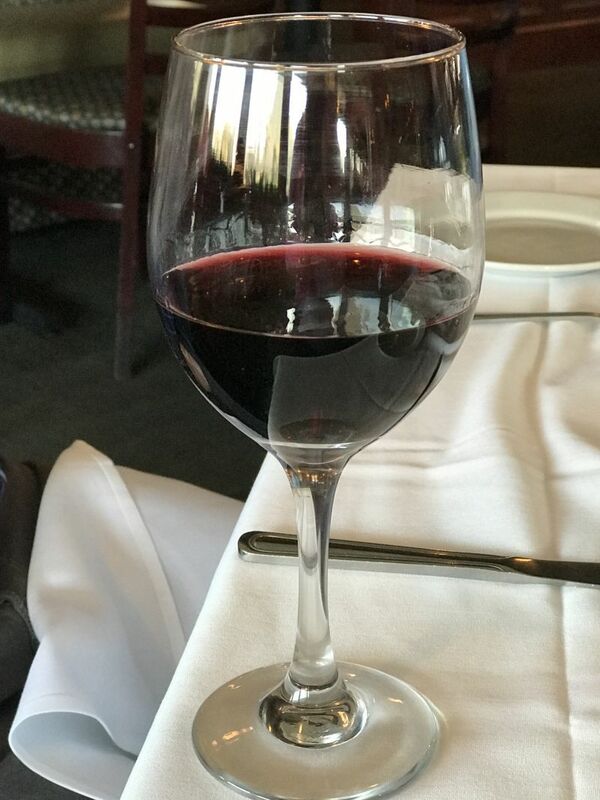 It’s a favorite go to wine for me. I was a little disappointed with the cook on my burger. It was medium/well rather than medium/rare as I had ordered it, but it wasn’t overcooked to the point of death or inedible. I was so impressed with the juicy flavor and quality of the meat that I was happy even with this small mistake in cooking. The fries were the perfect accompaniment. The bun, the lettuce, tomato, and onion were all just delicious. It was such a large burger I only managed to eat half of it, but my table mates ate the rest. They didn’t want it to go to waste, being that good. Still our gluttony didn’t end there. Even though we were all so full, and our friends don’t eat dessert, we ended up ordering their flourless chocolate cake and four forks to share it. Holy moly was that good. Rich and decadent flavors with a slightly mousse like texture. 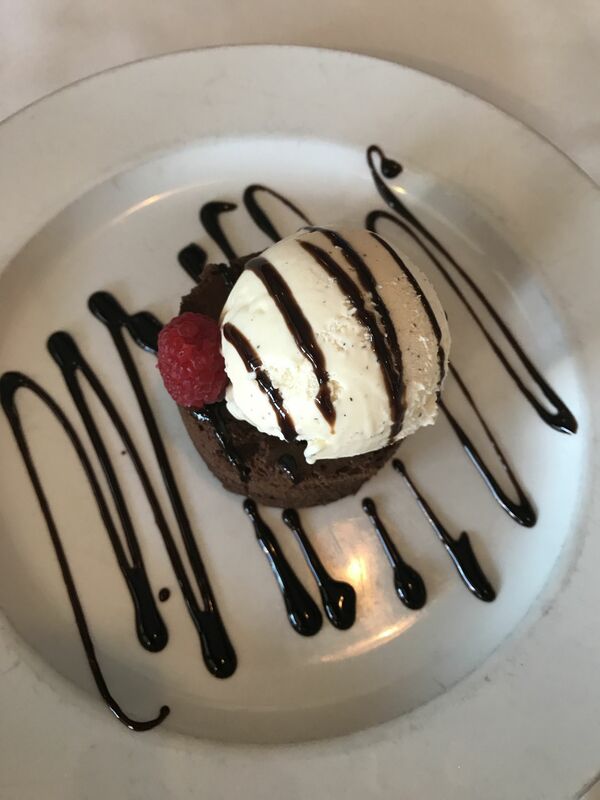 They served it with real vanilla bean ice cream and drizzled it with chocolate sauce. I would have liked it with a fruit sauce to give it an extra dimension, but it was outstanding as it was. We couldn’t eat it all, so we ended up taking it home. The Brit comments: The cake could travel home, but clearly the ice-cream would not survive the trip. In an example of British self-sacrifice, I saved the group from the pangs of guilt associated with wasted food by nobly eating the ice-cream. The food was great, the service was warm, efficient, and friendly. The restaurant had a great atmosphere. A perfect lunch with friends. We plan to visit their dinner murder mystery theater and hotel soon. We shall write all about it. We also have to find out more about their wine school. We will report back to you about this soon. This goes on our highly recommend list. Be careful! Check your credit card statement! The pilothouse (that’s the restaurant) fraudulently charged me $55.08. I never charged anything on my credit card at the restaurant and certainly did not sign for anything. And when I called, I was promised a call back from Jeremy or Justin (maybe Dustin that same day. But NO CALL BACK. So I called again to a ‘snarky’ front desk person that explained he could not help me because he was “just” the front desk. He transferred me to the restaurant. I then left a message for “Bob” the manager. Now, I must go through a fraud claim. 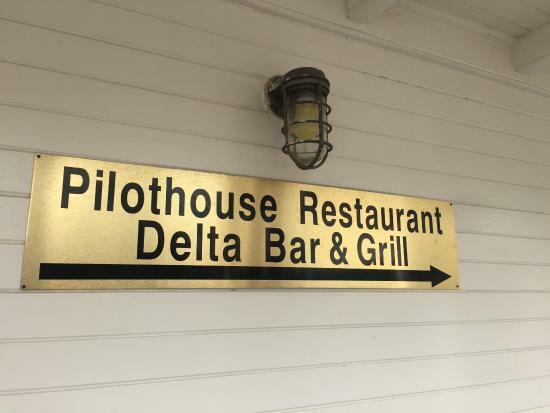 Again, FRAUD CHARGE AND NO CO-OPERATION FROM PILOTHOUSE. I never presented my credit card at the restaurant so it HAD to go through front desk. Run around and fraudulent charge. And I didn’t even bring up the clogged sink in the room…..
Wow, what an experience. We are sorry that happened to you. Thanks for sharing.